Kiehl's Since 1851 Superbly Restorative Argan Dry Oil, 4.2 oz. 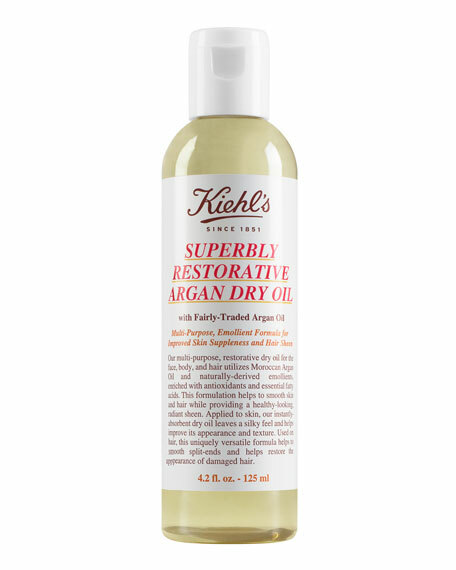 Kiehl's Since 1851Superbly Restorative Argan Dry Oil, 4.2 oz. Multi-purpose, restorative dry oil for the face, body and hair. With a blend of fairly-traded, organic Moroccan Argan Oil and other antioxidant-enriched emolients. Protects and smooths skin, while improving the appearance of skin tone. Helps to smooth split-ends and adds a healthy sheen to hair. Scented with a blend of Orange, Patchouli, Eucalyptus, and Cedarwood essential oils. Argan Oil: Argan oil has been utilized for centuries in Morocco for its skin restorative and various therapeutic properties. Native to Morocco, the argan tree produces egg-shaped nuts from which a very fine, edible oil is produced with valuable nutritional, medicinal and cosmetic properties. Not only is argan oil used for its distinctive taste in foods, but it is naturally rich in poly-unsaturated fatty acids and natural vitamin E, nutrients vital in helping to maintain skin's youthful, radiant appearance and feel.The 100% organic argan oil used in our Superbly Restorative Preparations features ahigh content of antioxidant-rich tocopherols, plant sterols, and essential fatty acids (EFAs). It is 80% unsaturated, containing eight essential fatty acids including linoleic and oleic acids, which help to protect and maintain skin resilience, smoothness and radiance. The high levels of tocopherols in argan oil also aid in anti-free radical activities and protection against oxidation, which is a cause of skin aging. Antioxidant-rich Vitamin E, Olive Oil and Avocado Oil help skin to defend itself from free-radical damage caused by external environmental aggressors.